This U.S. presidential election season is leading us to rethink a lot of norms. But while it feels like a lot of our political conventional wisdom is getting turned on its head, one thing that hasn’t appeared to move forward is how we talk about the economy. We’re focused on jobs, but we’re skipping a necessary discussion of how the digital economy is shaping those jobs. The content of the campaigns still seems largely rooted in the 20th century while much of our work is rushing to meet the demands of the 21st. The candidates are talking about cybersecurity (indeed they even agreed on its importance in the first debate) – but even that has been dealt with largely in glancing blows. Hillary Clinton has a tech and innovation agenda . And Donald Trump gave entrepreneur Peter Thiel a prominent speaking position at the Republican convention. But their views on how the digital economy will move the country forward still seem unclear. The world’s five largest companies (by market capitalization) are all American and compete in the digital sphere: Apple, Alphabet, Amazon, Microsoft, and Facebook. As most of us know by now, we have an increasingly internet-powered economy. A 2011 McKinsey study estimated that the internet accounted for 21% of GDP growth over the previous five years among the developed countries studied, a sharp increase over the 10% contribution over the 15 years prior. The rise of the so-called “gig economy” has reshaped how we think about business models and jobs, exemplified by the likes of Uber and TaskRabbit. According to a study by Harvard’s Lawrence Katz and Princeton’s Alan Krueger, all net new jobs created in the U.S. since 2005 are due to this phenomenon. More and more workers are contractors or freelancers and are increasingly relying on digital intermediaries to do their work. What we could be talking about: Strategies for leveraging the intrinsic strengths of the U.S. digital industries. Can we enable greater innovation through public-private partnerships to accelerate growth, enhance productivity, and create jobs? Even as the internet creates jobs, it makes other jobs obsolete. Erik Brynjolfsson, and Andrew McAfee at MIT have been arguing that advances in digital technology and its applications to automation — from improved industrial robotics to automated translation services — explain the slow employment growth of recent years, and the situation will only get worse. Consider some sobering analysis from McKinsey based on an analysis of over 750 occupations. If you are a bookkeeping accounting or auditing clerk, 86% of your tasks could be automated with current technology - and there are 1.6 million such workers; as a stock clerk and order filler, 85% of your work could be automated now – and there are 1.8 million such workers; as a food preparation and serving worker, including fast food, 74% of your tasks could be automated — and there are 3 million such workers. A different tool can predict any job’s automation risk, based on an Oxford study . Until now the jobs at risk fell into very specific categories; with artificial intelligence, big data, sensor technologies, driverless cars, advanced robotics and 3D printing, among other offshoots of digital technology, more sophisticated tasks will be next. What we could be talking about: Strategies for incorporating rising automation into our workplaces and for reskilling workers to meet these new challenges. The changes cited above are going to continue to exacerbate inequalities. The value associated with digital industries accrue to the owners of capital and the highest-skilled workers. Over the past three decades, labor’s share of output has shrunk globally from 64% to 59%, while the share of income going to the top 1% of Americans grew from 9% in the 1970s to 22% recently. Access to the digital infrastructure is now a critical factor in determining access to opportunities for moving up the income ladder, productivity and access to essential services. 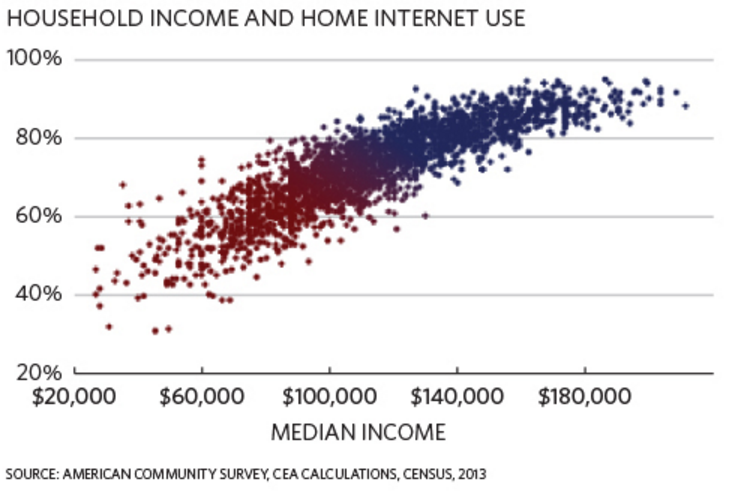 According to statistics compiled by The White House, in 2015, one in four Americans did not have internet access at home; Hispanic, Black and Native American households trail white households in internet adoption by more than 10%; overall, older, less educated, lower income, and rural households have fewer choices and slower internet connections, setting up a vicious cycle and deepening a “digital divide”. Even the benefits of the gig economy are not evenly shared; consider the top cities for ridesharing : they are concentrated in the tech-friendly urban areas, generally far from the electoral battleground states of Ohio or Florida. In other words, a laid-off factory worker cannot automatically be expected to make up for lost income by driving for Uber. What we could be talking about: How digital entrepreneurship is geographically distributed and how to improve the infrastructure of our internet, providing access to digital opportunity more evenly across the U.S.
Much of the election rhetoric has focused on the ongoing competitiveness and trade agreements with other countries, notably China, as well as those associated with the Trans Pacific Partnership. It turns out, China, is mounting an even more profound competitive threat on the digital front. Our Digital Evolution Index indicates that China is leading the world in digital momentum, while the U.S. ranked 30th out of the 50 countries studied. Of late, it is China, not Silicon Valley, taking the lead in developing mobile technologies. As for the manufacturing advantage that often propels China to the forefront, there is a new – digitally led — frontier emerging that will continue to drive a competitiveness wedge between U.S. and China. While, there are still only 36 robots per 10,000 manufacturing workers in China, Beijing has set a goal of raising the robot-to-worker ratio to more than 100 by 2020. The Chinese government’s “Made in China 2025” initiative provides manufacturers with hundreds of billions of dollars worth of resources for technological upgrades, including advanced machinery and robots, according to McKinsey’s prediction of an impending robot revolution in China. This will add to a compounding of the job creation challenge in the U.S. as Chinese manufacturing renews its global competitiveness. What we could be talking about: Where U.S. competitiveness sits in the world of emerging technologies and how U.S.-based companies plan to innovate to meet the competitive challenges of tomorrow. We should have an honest conversation about the fact that jobs, competitive advantage, and productivity are no longer stuck in an early 20th century model of industrialization. The World Bank’s World Development Report 2016: Digital Dividends proposes investing in the “analog complements” of the digital economy, including adapting skills to get the most out of the digital revolution. The report argues that governments ought to facilitate innovation and strengthen education and skill building. It is even more essential now to invest in an education system that fosters the critical thinking, humanistic and creative skills that set them apart from automated and AI systems. Digital technologies, from computers to MOOCs to interactive games can help reinvent public education. What we could be talking about: How schools are planning to teach their students the skills and thinking necessary to thrive in a digital world. Of course, some will argue that U.S. election campaigns are simply about battleground states. How can Ohio, for example, benefit from this focus on digital or other new-fangled industries? I would argue that even in Ohio, there are exciting possibilities being ignored by the campaigns. The candidates would do well by reading The Smartest Places on Earth, in which authors Antoine van Agtmael and Fred Bakker have spent considerable time and energy visiting a multitude of putative future brainbelt locations in the U.S. and elsewhere. Their conclusion: Akron, Ohio, is one of the “smartest places on earth” and it could very well be re-positioned from being yesterday’s tire capital to tomorrow’s polymer capital of world. Granted polymers are a far cry from the digital economy, but just as rich with possibilities. But at the very minimum it requires the next leader of the Free World – whoever that turns out to be — take a step into the 21st century.